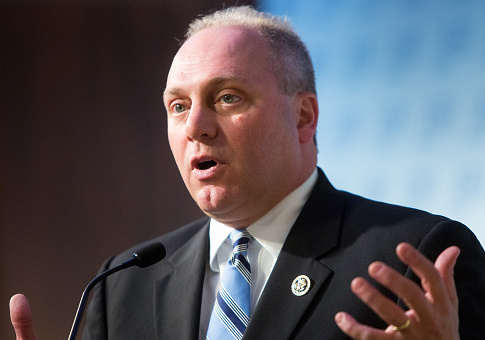 Rep. Steve Scalise's (R., La.) first interview since he was shot during a Republican congressional baseball practice will air on CBS's "60 Minutes" on Sunday. In June, Scalise, the House majority whip, was shot in the hip during a GOP baseball practice by James Hodgkinson, a left-wing devotee of Sen. Bernie Sanders (I., Vt.). Hodgkinson shot three others at the Alexandria, Va. ball field before police brought him down, and Scalise was nearly killed, remaining in critical condition for some time. The congressman's recovery has come a long way since that time, CBS reports. "He barely survived," CBS anchor Norah O'Donnell said Wednesday on "CBS This Morning." "He was barely alive when he made it to the hospital, and he had multiple infections, so it's been a long road to recovery." Scalise has stayed out of the public eye during his recovery, and Hodgkinson died of his wounds while the topic faded from headlines. O'Donnell even implied that viewers may not remember the assassination attempt as she announced the "60 Minutes" interview. "Maybe you remember, it was just about three and a half months ago that the Republican majority whip was shot during the congressional baseball practice," she said. "Remember, we covered it live here on the air." O'Donnell promised that the interview will address Scalise's story of survival in-depth. "The House majority whip agreed to help us piece together what happened on that day in June and his road to recovery," O'Donnell said. "Scalise was shot in the hip, the bullet lodged inside of him; it never exited, it caused heavy internal bleeding. We also talked to his wife and the doctors who helped save his life. It's an incredible story as he's been in the hospital ever since." She also said Scalise credits his survival to the "many miracles" he received. "He's doing much better, and he'll walk us through his recovery and what he calls the many miracles that saved his life," O'Donnell said. The congressman gave his first public remarks last week, when he told attendees at the Louisiana Family Forum's annual legislative awards gala that he can't wait to "get back home." The remarks were made through pre-recorded message as Scalise remains in inpatient rehab in Washington, D.C. This entry was posted in Politics and tagged 60 Minutes, Steve Scalise. Bookmark the permalink.